Delegate your errands to someone who wants to do them. Are you looking for help with chores and everyday tasks? Wouldn’t it be great if we could let someone else do some of our daily chores for us, especially at a reasonable price? With Work Pilots, we can make this a reality. We bring together the people who need short-term help and those who are happy to help for some extra money, in an unbelievably easy way. Whether you’re looking help with a car wash, window cleaning, dusting, or yard work, you are in the right place. Offering jobs is quick and easy, and you can find help for casual tasks effortlessly on a short notice. By letting someone do the chore that’s waiting for you at home, at your cottage or at your parents’ house you not only ease your own life but give someone a chance to earn some money and get work experience. You can download our app from your phones app store for free, or you can use our service directly from your computer here. Work Pilots was created from our desire to be involved in solving the challenging unemployment situation. The problem isn’t that there wouldn’t be jobs, enthusiastic workers or people who are willing to pay for a job well done. The problem is that these people don’t encounter each other when they need to. This is what Work Pilots is designed to do. To find the right people for the right jobs at the right time. Please note, when you buy a Work Pilots service related to household chores, maintenance and general improvement of your home or summer cottage, as well as information technology installing and guidance services you may be eligible for a household deduction! Check the details from the tax officials in your country. WHAT KIND OF TASKS ARE PERFECT FOR WORK PILOTS? Not many of us love cleaning. Washing your windows, stove or sauna is something you normally do only when you have to. 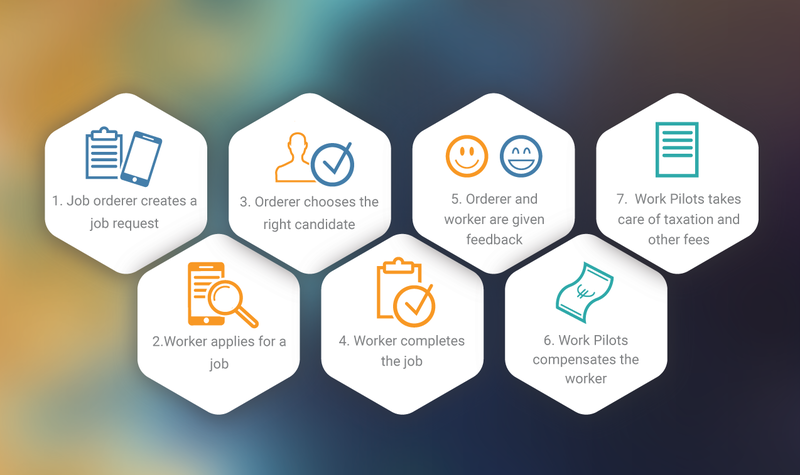 Now you have a solution: Create a task in Work Pilots, choose the right worker and agree a good time to get the chore done! The grass is growing, but it would be great to do something else than spend hours mowing the lawn. No worries. Work Pilots will help you take care of it. Same goes to small forest work or shoveling snow in the winter. Is your computer, printer, television or mobile device acting up? Is it hard to find the right information online? You can also turn to Work Pilots in these problems and get your gadgets working again as they should. Do you need someone to walk or feed your pets once in a while? Work Pilots can also help with this. From the feedback given to the workers you can choose the right care taker for you best friend. Sometimes you encounter situations where an extra pair of hands would be useful, whether it’s moving boxes or furniture Work Pilots can help! Washing your car at a gas station can be costly and time consuming. What if you could give your car a thorough hand wash and for a cheaper price at our own yard? Many seniors suffer from loneliness. What if you could order someone to go and chat, read or even play a song to you or to a friend of yours? We wanted to develop an application, which would make offering small chores from your list to someone else’s list as easy as possible. You can post a job on your mobile device and Work Pilots will find someone near you to do the job for a fixed hourly price. This way, you know exactly how much the task will cost. With the simple user interface you will be able to easily control the whole process and you only pay for the work that is done. With feedback from both sides you can see how the workers have been rated for previous jobs. Thanks to its strong information security and risk management analytics the service minimises the possibilities of misdemeanours. You can give someone the chance to do something they like, make some money for themselves and give them valuable work experience. Thanks to the transparent pricing you know that the worker will get properly compensated for their work. The background service automatically takes care of the contract and taxes and thus prevents gray economy.